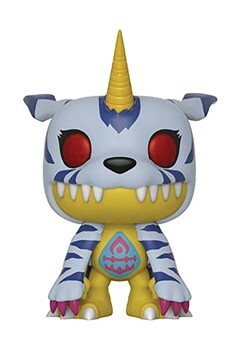 From Funko. Protect your collection from the evil forces of the Digital World with this series of four soon-to-be-released Pop! Vinyl figures inspired by the world of Digimon! DigiDestined friends Tai Kamiya and Matt Ishida and their Digimon, Agumon and Gabumon, are a formidable force armed with flames blue blaster, pepper breath, horns, claws and more! Each Pop! Vinyl figure stands about 3 3/4' tall and comes in a window box for display..